I want to install Ubuntu 16.04.2 with Windows 10. I created partions for home , root and swap. After clicking Install, I got following error. Note: My partition table type is gpt. But cliking F2 , I come to BIOS,not to UEFI. The partition table format in use on your disks normally requires you to create a separate partition for boot loader code. This partition should be marked for use as a "Reserved BIOS boot area" and should be at least 1 MB in size. Note that this is not the same as a partition mounted on /boot. I am writing an answer in order to include a screenshot, to make things easier to see. Otherwise, if you want to install Ubuntu in UEFI mode, you must first boot the computer in UEFI mode. Things are more convenient with Ubuntu in the same boot mode as Windows, and if Windows 10 was installed by the manufacturer or vendor, I think it is installed in UEFI mode. The flag is not a file system. Do not make any file system. 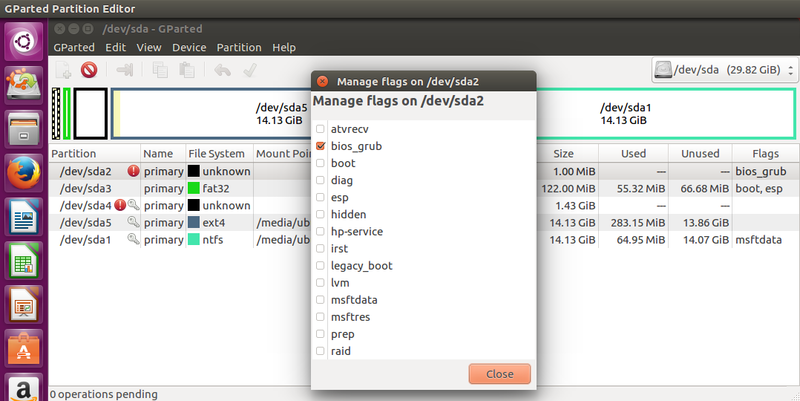 Instead right-click on the partition in gparted and select 'Manage Flags'. Then you get a menu, where you can select the correct flag. I think this screenshot will help. Not the answer you're looking for? Browse other questions tagged partitioning system-installation or ask your own question.